Jeremiah came to our Meriden Portrait Photography studio for his Newborn Mini Photography session at 10 days fresh. Newborn Mini sessions are perfect way to capture a few poses of your brand new baby in a shorter session. Jeremiah was such a dream to work with. I loved the Aqua & grey we used throughout his session. It will match his nursery just perfectly. Check out my favorites from his session below! Want to see some more newborn sessions? Check them out HERE! 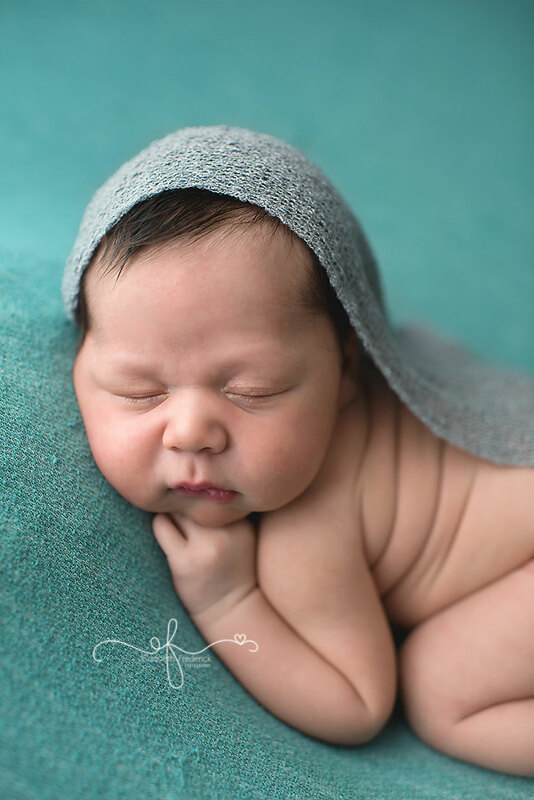 Elizabeth Frederick Photography is a CT Newborn & Baby Photographer located in the central Connecticut servicing all of CT including New Haven, Litchfield, Fairfield, Hartford, Tolland & New London Counties. EFP is best known for her use of color & props throughout the session for a truly custom photography session. If you are searching for a Connecticut Newborn Photographer, CT Newborn Photography, CT Baby Photographer, CT Smash Cake Photographer, CT Maternity Photographer, CT Maternity Photography, CT Smash Cake Photography, CT Pregnancy Photographer, New Haven CT Newborn Photographer, West Hartford Connecticut Newborn Photographer, Southbury Connecticut Newborn Photographer, CT Fall Mini Session Photographer, CT Family Photographer, Portland CT Photographer, CT Smash Cake Photographer, CT Holiday Photography or CT First Birthday Photographer, please contact me at liz@ElizabethFrederickPhotography.com at your earliest convenience. Elizabeth Frederick Photography books 2-4 months in advance. It is best to book your Newborn Photography session while you are still pregnant to guarantee availability. How Did you Hear About EFP? Elizabeth Frederick Photography is a CT Newborn Photographer specializing in CT Newborn Photography, CT Baby Photography, & CT Smash Cake Photography servicing all of Connecticut including New Haven, Hartford, Fairfield, Tolland, Litchfield, New London & Middlesex counties. Elizabeth is best known for her vibrant colors and use of props throughout her sessions.